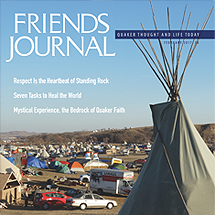 Features: Seven Tasks to Health the World by Michael Soika; Respect is the Heartbeat of Standing Rock by Shelley Tanenbaum; Mystical Experience, the Bedrock of Quaker Faith by Robert Atchley; I Am Not a Religious Person by Sarah Pennock Neuville; Ohio Yearly Meeting Gathering and Quaker Spring by John Andrew Gallery. Poetry: Wallops Island Celestial Meeting by George Eastburn; Where is Your Brother? by Dudley Warman. Departments: Among Friends; Forum; Viewpoint; Art and Culture; Books; Top Five; Milestones; Classified; Meetings; QuakerSpeak.